Angels and miners were first portrayed together as light bearers in a painting of the miners’ guild altar in Annaberg’s town church, painted in 1520. Inspired by this miners began to portray themselves as light bearers from the end of the 18th century, sometimes even as self portraits. As carved candle holders they were initially one-offs, which were produced by miners after work. This is how the typical wooden miner in mining uniform with his working tools holding candles in his outstretched arms came about. 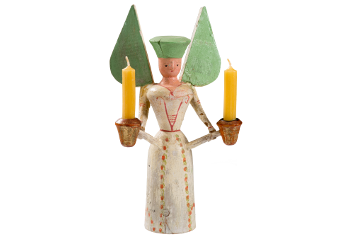 Angels as candle bearers originated in the religious sector as bearers of the holy light. They were interwoven with Christmas customs by the angel of the annunciation who was once lowered from the church ceiling during Christmas nativity plays. The miner and angel were often designed as pairs, matching in size and design. The demand for candle bearers rose when simple mining families were able to afford such a light source too due to the invention of the cheap stearin candle in the 19th century. Demand could no longer be met by the individual carving of single figures. 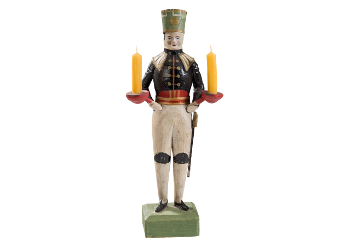 As a result wooden candle bearers turned on a lathe appear in toy retailers’ catalogues and price lists from the mid-19th century. 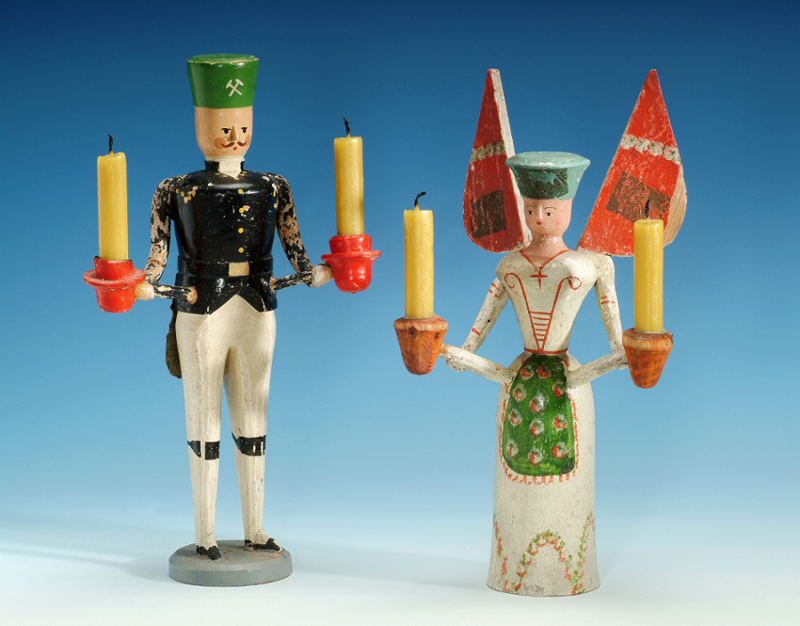 The first manufacturers in the Seiffen region included the toymaker Wilhelm Friedrich Füchtner (1844-1923), who was well-known for his nutcrackers. Early candle bearers have a wooden body, their arms by contrast are made of a very fragile dough material, bread dough. This was produced out of fine wood shavings, rye flour, paper, powdered chalk and pearl glue and permanently coated and reinforced with paint to be able to bear the candle’s weight. It was only once mass production started that the arms were turned on a lathe too, which at the beginning were stabilised using wooden “struts” attached to the body. Special models were designed which were more elaborate for example the candle bearer that is holding a candle arch over its head or the miner or angel bell. The toymaker Albert Füchtner was the first to design the latter (1875-1953). Separate regionally specific customs developed around the candle bearers. Every boy receives a miner once during his childhood and every girl gets an angel. These were placed in the window during Christmas. As a result, when walking through the towns and villages during Christmas you could clearly see how many boys and girls there were in the individual families. A custom that is still practised in many places today.